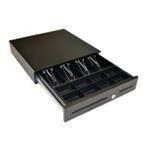 APG's Entry Level Cash Drawers, ECD, are a range of cost effective, highly functional cash drawers that offer excellent value for money. Carefully selected from a number of quality industry acclaimed manufacturers, the ECD range is perfectly suited to a variety of sectors, including hospitality and general retail, where a good performing cash drawer is appreciated but a heavy-duty lifetime is not expected. The ECD410 model is a hard wearing cash drawer with a high volume insert accepting the majority of European currencies, therefore it is the preferred choice of leading retailers worldwide.